Have you noticed how it is getting dark earlier at night these days? The thing I like least about fall and winter is how early the sun goes down. Today I'm sharing a simple, pretty solution to the dark hours ahead of us. Read on for a DIY fall decoration that will light up your life. This post contains affiliate links for your convenience. The compensation I receive when you shop with these links helps to support the costs to publish this blog. There are two solutions I gravitate to to solve my dislike of the dark nights of fall and winter. Sure, you can turn on the lights, but I prefer little pockets of light to brighten the dark corners of my rooms. For that, I'll use either flameless candles or strings of mini LED lights. Flameless candles with automatic timers are my first love. You'll find them all over my house. They are easily tucked into shelves and fit nicely into bathroom and bedroom decor. They make perfect night lights. The strings of LED lights are a favorite for seasonal decor. They work on wreaths and look sparkly in glass containers. You can find these LED in many retail stores and at many price points. Some even have seasonal holiday bulbs. I tend to choose plain bright white lights because they go with everything. 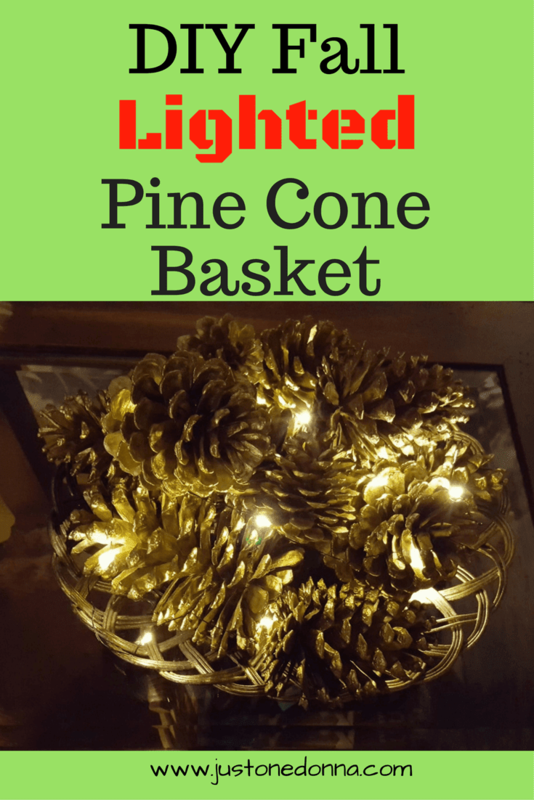 They were the perfect choice for my DIY pine cone basket. This project will take you a couple of days, mainly because of drying time for the paint. Prepare your basket and pine cones. This is a great project to repurpose an old basket you have in your basement like I did. When using an old basket you'll want to clean it first. Go ahead and give it a good wash. I wash my baskets in a hot water and dish detergent. Then I set them outside to completely dry. If you gather pine cones for this project you will want to clean them, too, to remove any dirt and bugs. I like to clean mine in a bucket of hot water with vinegar and dish detergent. Rinse them well and let them dry in the sun or in a low oven, set at 200 degrees F.
Paint the basket and pine cones. Spray painting is something I like to do outside. I use old plastic tablecloths as my spray paint mat. They work well to protect any surface from the paint and can either be reused after the paint dries or discarded. 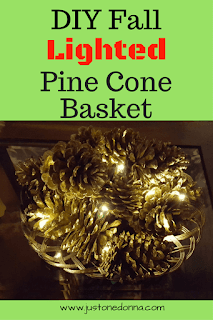 Spray both the basket and the pine cones lightly with the gold paint. Multiple coats of a light spray work much better than one coat that produces a finished product with drips. You'll find that each light coat of paint will dry very quickly and you'll be able to apply multiple coats in one day. Once the paint dries on the basket apply the antiquing glaze to give your basket an aged look. Let it dry. Assemble your lighted basket. Arrange the pine cones in the basket. 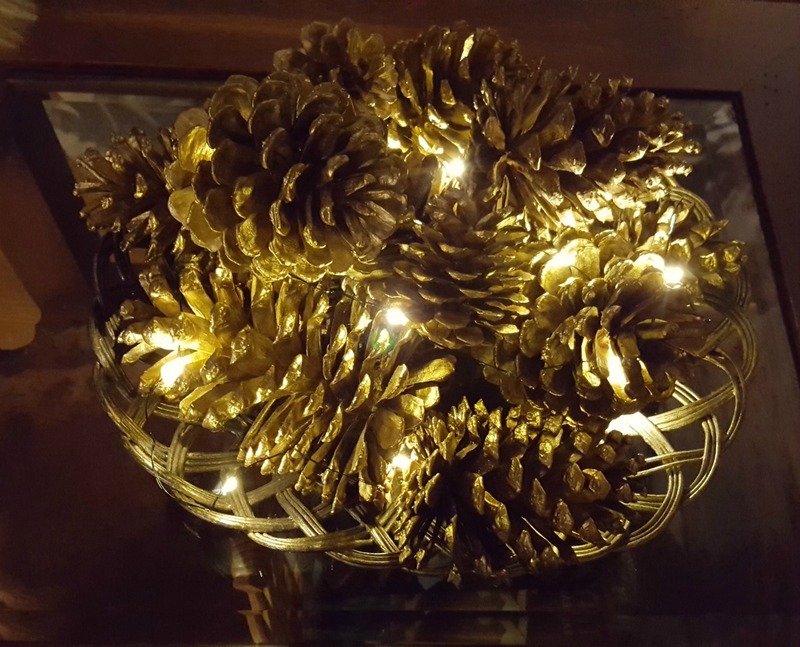 String the LED lights around and through the pine cones, hiding the wire as best you can. Set the timer to come on at dusk. Pay attention to the color of the light. Warm light, daylight, multicolor lights will impact the look of your decor. Take the time to choose the color you want. Pay attention to the color of the wire connecting the LED lights. If you want to hide the wire, choose a color that will blend in well. Choose clear or silver wire if you want to put the string of lights in a clear glass container. Know what kind of battery powers your lights. I only choose lights with AA or AAA battery packs. The batteries last longer, are cheaper and are easier to find in the stores. Multi-packs of these batteries can be purchased at nice savings. When using the timer, I usually only replace the batteries once during the fall-winter season. Thank you for sharing this recipe with your friends on social media. Publishing this blog twice a week takes a lot of time and effort on my part. Your support is greatly appreciated! I am very grateful for your shares on Facebook, Twitter, Pinterest, and Yummly.